The design for the Next Generation $50 was revealed yesterday by the Reserve Bank of Australia. It will be released into circulation from October 2018. This follows the redesigned $5 and $10 notes transitioned in the last 2 years and the $20 note will follow in 2019. 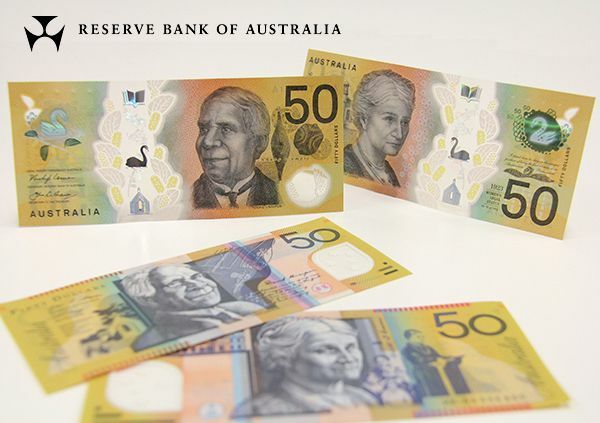 The new fifty dollar note will retain the same colour scheme and feature the same famous Australians Aboriginal writer and inventor David Unaipon and the first female member of parliament Edith Cowan. A theme of the Next Generation notes is to include a different species of Australian native wattle and bird on each denomination. The new $50 will depict an acacia shrub Acacia humifusa and the Black Swan. It will also exhibit security and anti-counterfeiting features seen on all new Next Generation notes such as a top-to-bottom clear window, the rolling colour effect, embossing and UV fluorescence. Microprinting features exerpts of David Unaipon’s book and Edith Cowans maiden parliamentary speech. David Unaipon features on the signature side of the note which, as collectors, we call the front. These signatures are Reserve Bank Governor Philip Lowe and Secretary of the Department of Treasury John A Fraser. Edit Cowan features on the serial number side or the back.